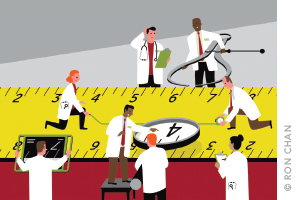 Our members just published an article - "Quality Measures - How to Get Them Right" in the July-August 2018 issue of Family Practice Management. Click here to go to the article. Click here for more resources. Care That Matters is a national coalition of health care providers and patients committed to facilitating the provision of health care that improves the lives of patients: no more and no less. More than 20% of health care provided in the US is waste . This waste includes health care that is not needed nor wanted. These wasteful interventions do not improve the health or the lives of patients; even worse, in many cases, they cause harm. Furthermore, because resources available for health care are limited, when they are spent on wasteful interventions, they are less available for more valuable diagnostic and treatment efforts - not to mention other societal needs. Much of the waste in health care can be attributed in one way or another to the fee-for-service payment mechanism that rewards the provision of services regardless of whether they were indicated or helpful. The pendulum is now swinging away from fee-for-service and towards payment mechanisms designed to reward value, which implies high quality and low cost. This requires some mechanism for measuring quality, which has proved surprisingly difficult to do in health care. Application of inappropriate measures of quality can cause similar problems, rewarding the wrong behaviors, resulting in waste and harms. Such pay-for-performance (P4P) schemes have been ineffective at improving quality  and result in opportunity costs (through distraction of attention and resources) and health care provider burnout, by undermining intrinsic motivation. Access to quality health care is a fundamental human right. Health care systems should be structured such that they deliver the highest quality care to the largest number of people possible. Measurement and reporting of quality is therefore essential, but it must be done properly. Be assessed and reported at appropriate levels; they should not be applied at the provider level when numbers are too small or when interventions to improve them require the action(s) of a system. Whenever possible (and desired), patients should be engaged in their health care, which should be designed to help them achieve their health-related goals. Decisions concerning health care interventions should be jointly reached by doctors and patients, informed by the best available evidence and the values and preferences of the patient, i.e. shared decision-making to achieve patient-centered care. We forge alliances with other organizations that share our values, principles, and goals. We educate the public, our health care colleagues, and policy-makers. Berwick DM, Hackbarth AD. Eliminating Waste in US Health Care. JAMA. 2012;307(14):1513-1516. doi:10.1001/jama.2012.362. Woolhandler Steffie, Ariely Dan, Himmelstein David U. Why pay for performance may be incompatible with quality improvement. BMJ 2012; 345: e5015.